To provide quality Christ-centered education for young children at an affordable cost. To provide opportunity for holistic growth and development for young children. To provide a loving, safe environment where children can experience security. To promote the welfare of children and their families through social development programs. When I took Early Childhood Education and Introduction to Biblical Counseling at the University of the Nations YWAM, I became aware of the needs of children as individuals and became burdened to reach them. I began to have a vision of starting a school. 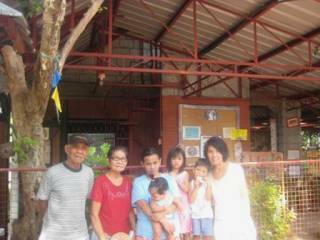 Upon completing the program, the Lord opened the door for me to teach hurting children in Olongapo. After a two-year commitment pioneering a preschool at YWAM Olongapo, the Lord called me to minister at the Smokey Mountain Preschool at YWAM Balut in Manila. While teaching at the preschool, I also worked in hospitality at the base where I was blessed to meet people like a family from New York who came alongside as friends and were an inspiration to me. After six years teaching and ministering in Balut, I became tired physically and emotionally. At that time my commitment to the base was about to finish. As I sought the Lord, I sensed that He had a new thing for me. So instead of renewing my commitment, I went back to my own family to have time to rest and to pray for further direction. What was the “new thing” the Lord had for me? One day, after being home about a week, I suddenly saw the beauty of this place, my home, Sariaya. As I was praying the Lord reminded me of my vision to build a school. I looked at our small garage; I saw many children surrounding it. Then I told God, “If this is the right place and the right time, You will confirm it to my family and friends.” When I shared my vision with my parents and brother, they agreed! The very next morning, my mother and father began cleaning the garage, and my brother, Willie, started to suggest how to transform it into a center for learning. I was so amazed how the Lord touched my brother to give his land for the center and how my father provided wood from his trees to make a fence for protection. I also shared about the vision with close friends from the U.S. and Canada, who cheered me on (and amazingly came to visit me after the school began, encouraging me that the hand of God was blessing the people in Sariaya). Piece by piece the Lord provided for the center until it became apparent it could open that very year! I then asked God to give me a name for the school. He led me to Revelation 22:16: “bright morning star” which means He revealed Himself. And so June 2007, Bright Morning Star Child Development Center opened its doors! Melanie who also teaches in the school.